The new Corvette Stingray’s redesign offers unparalleled performance control with a revived luxurious interior. Optimal weight reduction comes from carbon fiber structural components and a new aluminum space frame that replaces the outdated steel frames of previous models. The new steering system is boasted as five times stiffer than before with the smallest steering wheel ever in a Corvette, revealing an advanced digital control panel. You can choose from five custom driving modes where you can control all pertinent settings, from changing the radio to managing performance-level traction and handling. The Stingray’s new look comes in conjunction with Corvette Racing so it’s no surprise this sports car can hit 60 in only 3.8 seconds, although one was clocked in at 200 MPH on a closed Texas highway. Everyone has a different reason to protect their paint, wether its protecting your vehicle from your daily commute to work or you’re an enthusiast making sure that your new paint job stays brand new. 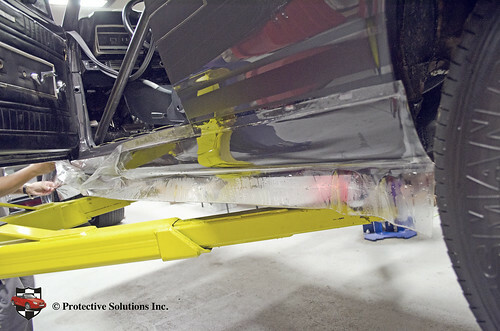 We have what it takes to protect your investment and your paint. Then there is your not so average enthusiast. How about a garage filled with over five thousand horsepower? Safe to say it blew my hair back. We only had the opportunity to wrap two of the five cars in the garage, one a blown Chevrolet Camaro with a whopping 800 horsepower. The other a Buick Fairlane with 700 horsepower, all motor. Both were completely rebuilt from the ground up and truly stunning. This enthusiast isn’t looking let these cars just sit and be rubbed with a rag either, we did custom coverage along the body line of each vehicle so that these monsters can be driven the way the were meant to on the street or the track and protected from burning rubber or stone chips from the massive tires both cars are tucking. Check out our install video on the Camaro!